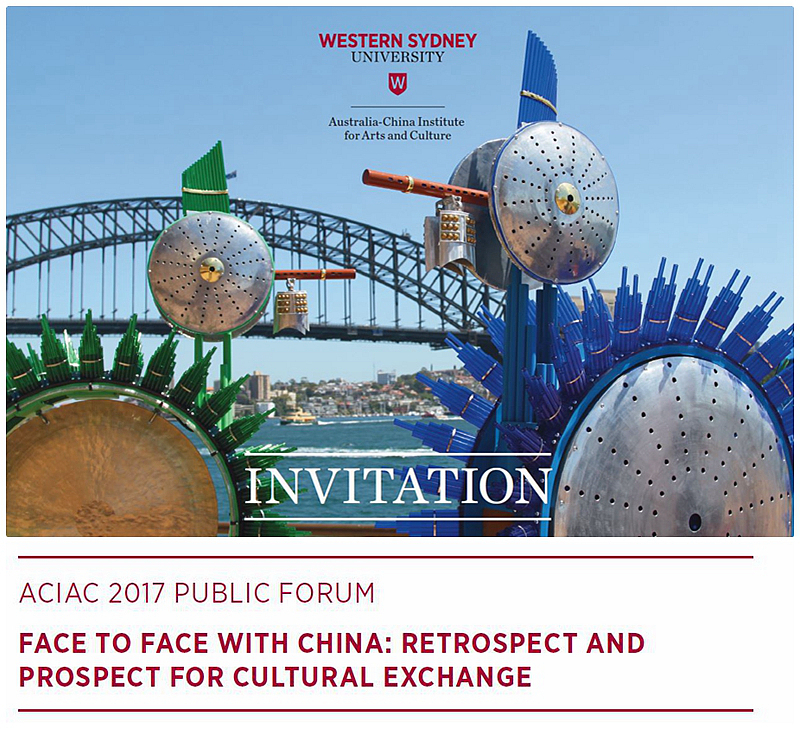 <!-noindex-> ACIAC | ACIAC 2017 Public Forum "Face to Face with China: Retrospect and Prospect for Cultural Exchange"
You are cordially invited to attend a Public Forum to discuss the present state and future prospects for cultural exchanges with China. FREE. Registration Essential. Limited seats are available, please RSVP HERE by Tuesday 23 May to ensure your seat. This forum is convened by the Australia China Institute for Arts and Culture (ACIAC), Western Sydney University (WSU), and kindly hosted by the China Cultural Centre (Sydney). The panel of speakers will be chaired by the Vice Chancellor of WSU, Professor Barney Glover. Speakers will include the Director of ACIAC Professor Jocelyn Chey, the Director of the China Cultural Centre (Sydney) Mme Zhao Li, former Australian Ambassador to China Dr Geoff Raby and the Program Manager, Chinese New Year Festival, City of Sydney, Mr Stephen Gilby.